Everybody watched him. The clock-tree's branches creaked in the soundless wind. He didn't move. He thought about Julia's warning: some great change of our fortunes. His fortunes were riding high right now, he had to admit. He had a goddamned castle, full of quiet courtyards and airy towers and golden Fillorian sunlight that poured like hot honey. Suddenly he wasn't sure what he was wagering that against. He could die in there. Alice had died. When I reviewed Lev Grossman's The Magicians in August 2009, I opined "the novel felt as though I had read of one youth's survival of his previous life and self and that the stage was now set for an interesting character study that would play off of the fantasy tropes that had been explored over the course of this first novel." The Magicians was in many respects a first stage, a travel through juvenile things and immature desires, passing through despair, ennui, and suffering, to something else. When that novel concluded, its protagonist, Quentin Coldwater, appeared to be a changed young man, no longer 17 and full of vague dreams and youthful angst, but a mid-20s adult who had suffered and lost much of what he had loved. The Magicians could have ended on that note, could have allowed us to imagine Quentin growing to accept what he did possess after his love was lost, but there were enough glints of future developments that Grossman wanted to develop, which lead to the writing of the sequel, The Magician King. The Magician King opens two years later. Quentin, along with Eliot, Janet, and Quentin's high school crush, Julia, are now the kings and queens of Fillory. Amid the questing and balls and hunts, Quentin is still uneasy about the contrast between the life of plenty he now has and the remaining guilt from watching his love, Alice, die during a confrontation with the Beast. He wants something else, something that makes him more than just a king at name. Some might think this is a reversion to the old Quentin, the moody, despondent spoiled kid of the first novel and to some extent this is true, but for most of this novel, Quentin continues to mature and to develop as a person and as a leader. Yet Quentin is not the sole primary protagonist. Julia, whose story from the early chapters of The Magicians to its conclusion was more hinted at than told, comes into her own here. For most of the novel, her backstory of how she became a magician is told in alternating chapters with the "present" of the quest that Quentin and she takes to find seven magical keys during an oceanic trip to the uncharted eastern boundaries of the Fillorian world. Julia's character is fascinating in how much she suffers, how deep she searches, and how she transforms herself in her quest to learn magic after her rejection from Brakebills. Grossman does an excellent job in developing her voice and having her past experiences serve as an echo for the events unfolding in the literary present. The Magician King differs from its predecessor in that Grossman is in greater command of the story. 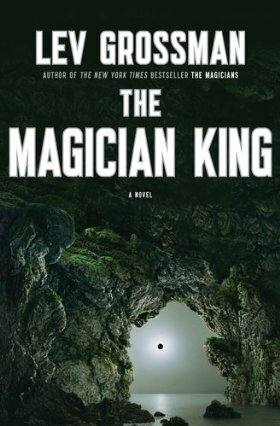 Whereas The Magicians was more of a reaction to other fantasies and other novels, replete with references to Harry Potter, Narnia, and 1980s and 1990s social commentaries, The Magician King is a much more assured novel that has a stronger voice of its own. Although Quentin and Julia do not forego the occasional snarky aside about their quest (after all, they have been there, done that, and do own the t-shirts), their search to find the keys to prevent magic from being removed from all realms is played straight. This is a more mature novel, one that does not eschew the incisive commentaries made in the first volume, but instead feels more confident in developing those themes and showing that in addition to fantasies being more dangerous than previously imagined, that they are also essential parts of our own lives and have an intrinsic worth much more valuable than the symbolic quests or adventures might indicate. All of this makes for a stronger novel. Instead of outwardly trying to "subvert" tropes or to reveal the fallacies apparent in quest fantasies, as was his wont in The Magicians, Grossman here is content to let the story and characters tell their own tales, with the result that we see real growth in Quentin and Julia's characters throughout the novel. This is not to say that we see full fruition here. If anything, the latter events of the novel, especially at the conclusion, feel as though Quentin is taking body-blow after body-blow, leaving him battered and more rightfully fit to be disenchanted than at any previous point in the two novels. Yet, he does not succumb to this and the novel concludes at an interesting stopping point. Although Grossman has said there would be one more novel featuring Quentin, it would be interesting to imagine him going on from this point, continuing his development unseen by the reader. Yet by the time he does realize this, everything is changing. However, Quentin has grown and he accepts this and this character developments makes The Magician King a triumph and it sets the stage for new possibilities with the maturing Quentin. Yet again I find myself satisfied with the conclusion and yet eagerly awaiting the likely final volume in Quentin's development. What more can a reader ask? Highly recommended.